Ever Wonder How The French Stay So Thin? They Eat This! Okay, maybe not. But this slimmed down French toast is pumped up with extra nutrition and skimps on fat, so you can enjoy this childhood favorite. 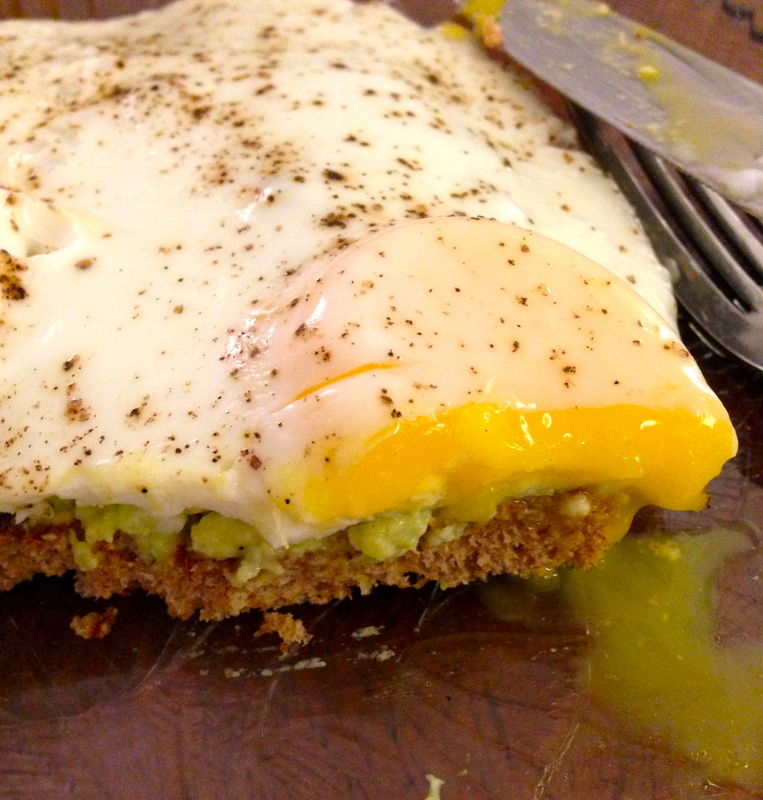 This recipe uses whole wheat toast and one egg with one egg white, so you can fuel up with fiber and protein. Also, some studies suggest that eating cinnamon with bread may help to maintain blood glucose levels and prevent a spike in blood sugar. Plus, it’s delicious! 1. Spray medium sized pan with nonstick vegetable cooking spray and warm over medium heat. 2. Crack 1 egg into bowl. Crack second egg and separate the egg white by transferring the yolk back and forth between the two halves of the egg shell, allowing the egg white to fall into the bowl below. Discard shells and one remaining yolk (*note: you can also buy a carton of egg whites and use the equivalent of 1 large egg). 3. Add splash of milk (about 1 Tbsp) to eggs. Add salt and pepper and scramble well with fork. 4. 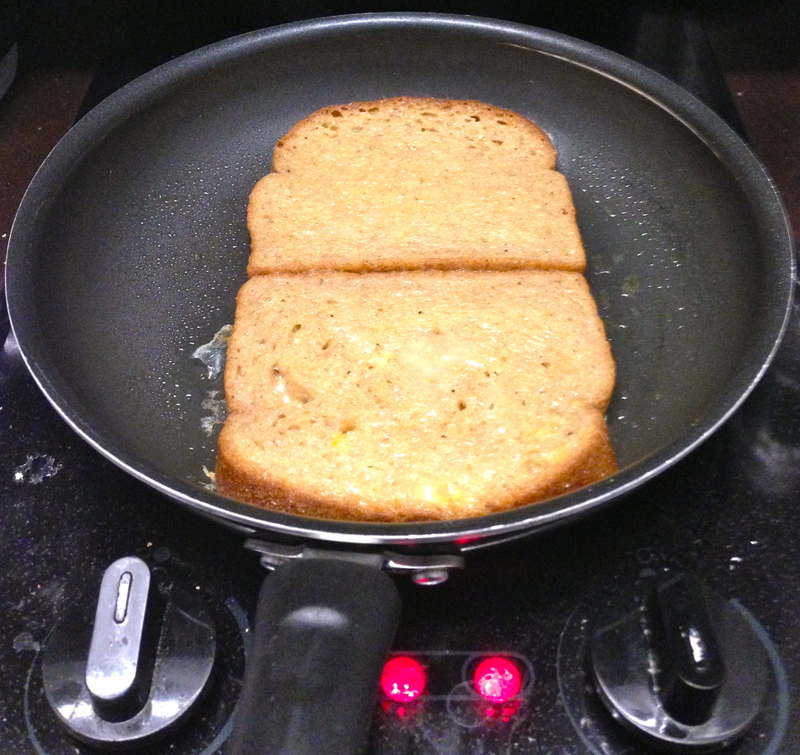 Soak each piece of bread in the egg mixture (coating well) and transfer to pan. 5. 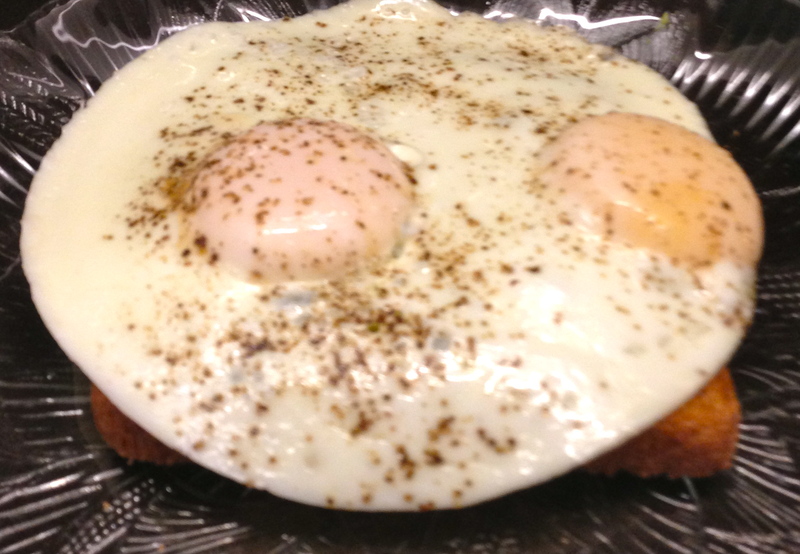 Cook bread about 7-10 minutes on each side, until French toast becomes golden brown and egg is cooked thoroughly. Transfer to plate. 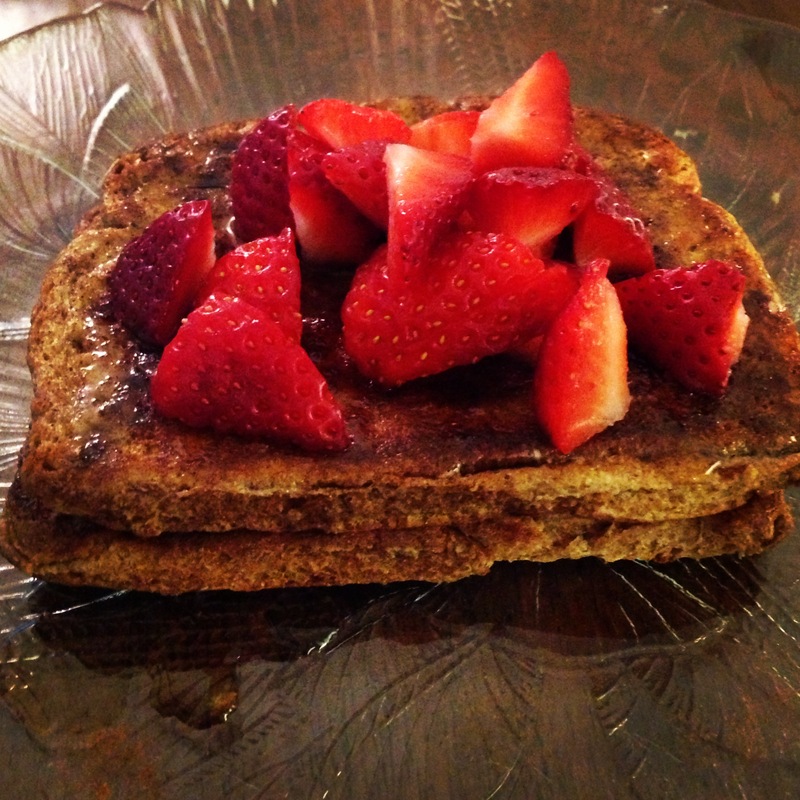 Top with butter, cinnamon, strawberries and maple syrup. Enjoy! This seasonal salad is packed with vitamins and minerals and will keep you warm in these chilly temperatures. Beets and kale are both vegetables that can be grown through the winter and bought at local farmer’s markets and grocery stores during this time when vegetables can seem scarce. 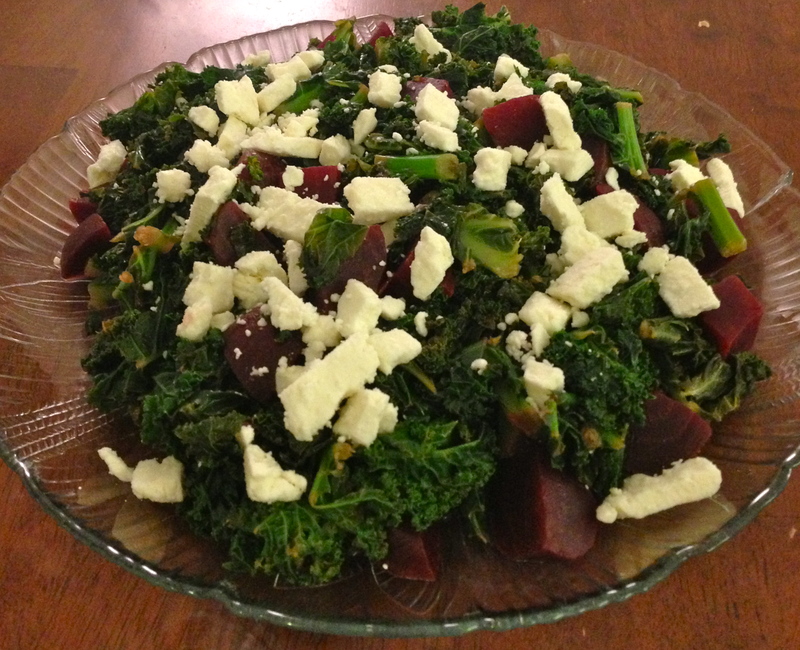 The hearty, crisp taste of kale is balanced by the sweet taste of beets and creamy feta cheese in this warm salad, which is a cinch to make. As tasty as it is pretty, this winter-y salad will become your new favorite for entertaining – or just eating on your own! 8 oz. 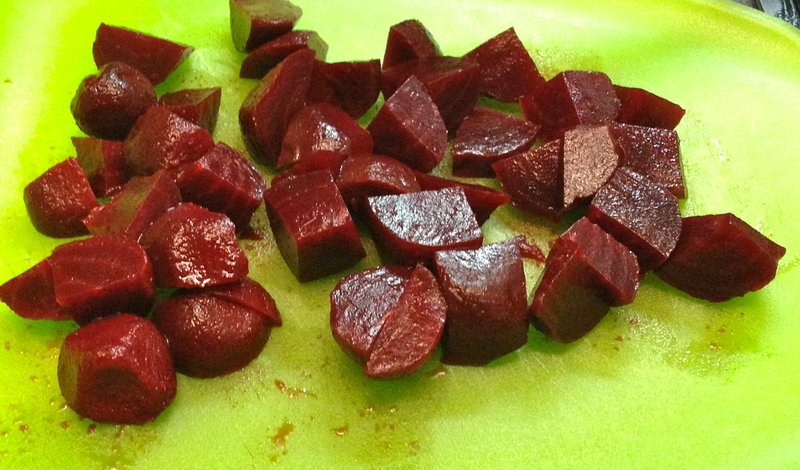 baby beets (I like Melissa’s Ready-To-Eat Baby Beets, which are steamed, peeled and ready to eat. 1 package is 8 oz, which is about 5 baby beets. You can also roast your own beets! If you roast your own, you should do so before preparing this dish, as they should be ready to eat in this recipe). 1. Heat olive oil in large pan over medium heat (I recommend using a pan with large sides, or a pot, as the kale starts out piled high in the pan before it cooks down). 2. Add kale to pan. Add water and cover. 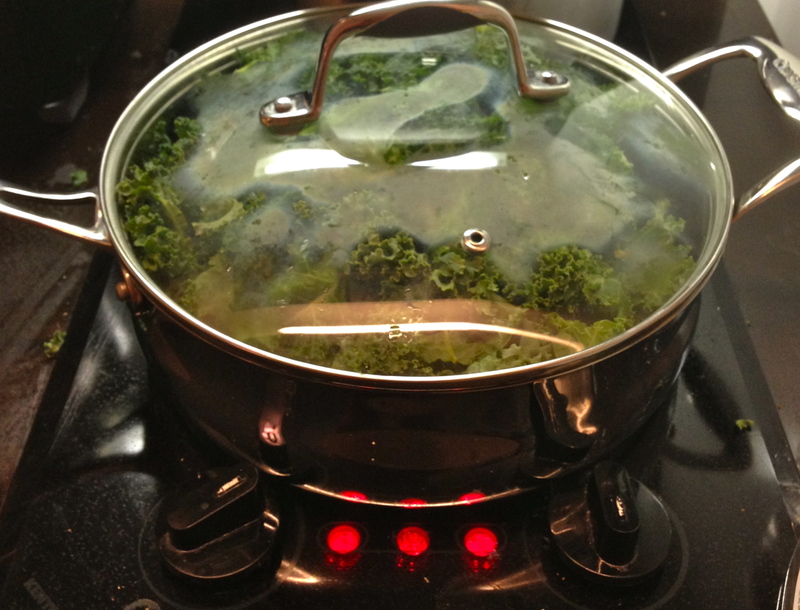 Allow kale to cook covered for approximately 5 minutes. The kale should be a bright green color and there should be some excess liquid when the cover is removed. 3. Remove cover and stir kale until it begins to wilt, about 3 minutes. The liquid should be mostly evaporated by now. Add lemon juice, salt and pepper and cook another 2-3 minutes, stirring occasionally. 4. 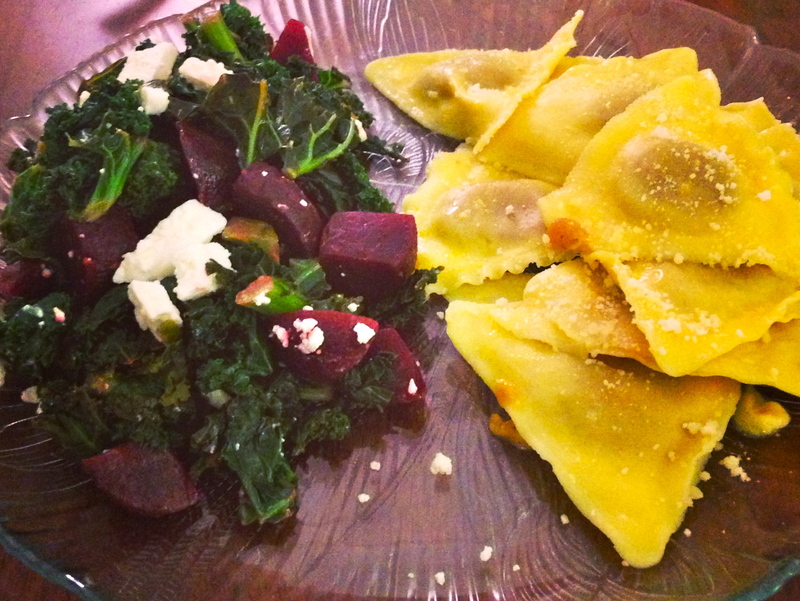 Cut beets into wedges and add to kale. Cook 2-3 minutes, stirring occasionally. Transfer from pan to serving dish. Top with feta cheese and serve warm. Enjoy! I served it with butternut squash ravioli! This healthy take on a tuna salad replaces mayonnaise with olive oil and lemon juice, which cuts the fat content of this dish, adds healthy monounsaturated fat, and gives the tuna salad a lighter taste. Ideal for taking to work or eating right at home, this healthy lunch gives you protein, fiber, vitamins and minerals so you can be strong, focused and satiated! 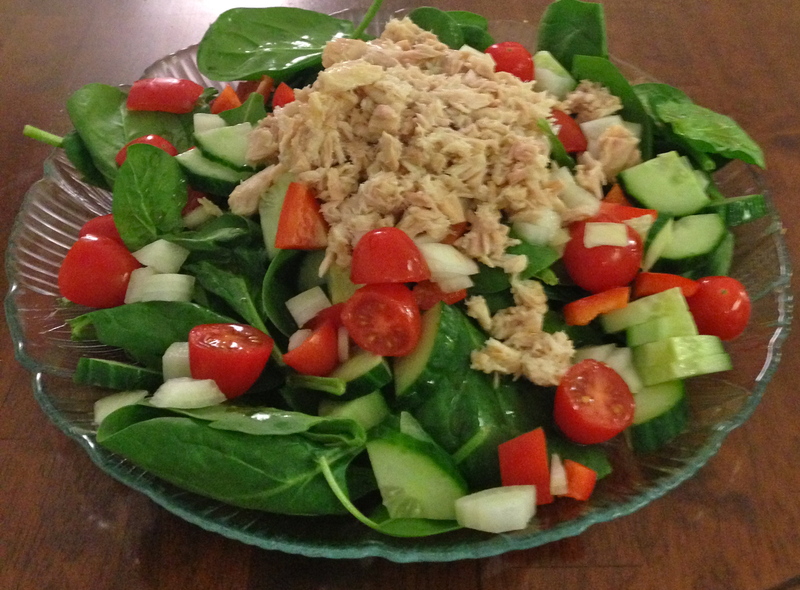 a lighter tuna salad! dressed with extra virgin olive oil and lemon juice – hold the mayo! 1. Drain water from tuna and pat dry with paper towel. 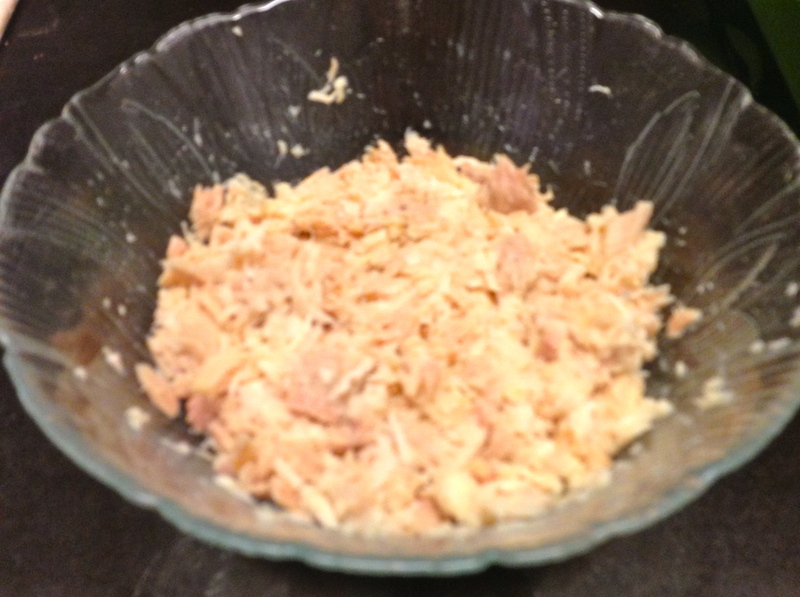 transfer tuna to small bowl. 2. Add 1 Tbsp olive oil and lemon juice to tuna and mix well with fork. Set aside. 3. Place spinach on plate (or in bowl). Add tomatoes, onion, cucumber slices and chopped bell pepper. Add tuna on top. Dress with remaining 1 Tbsp olive oil and red wine vinegar. Enjoy! In these chilly temperatures, I’m craving comfort food. However, I don’t want to eat food that isn’t healthful – I just want to eat a warm, hearty meal. This chicken parmesan is baked, instead of being pan fried, and uses olive oil instead of egg to glue the breadcrumbs to the chicken. 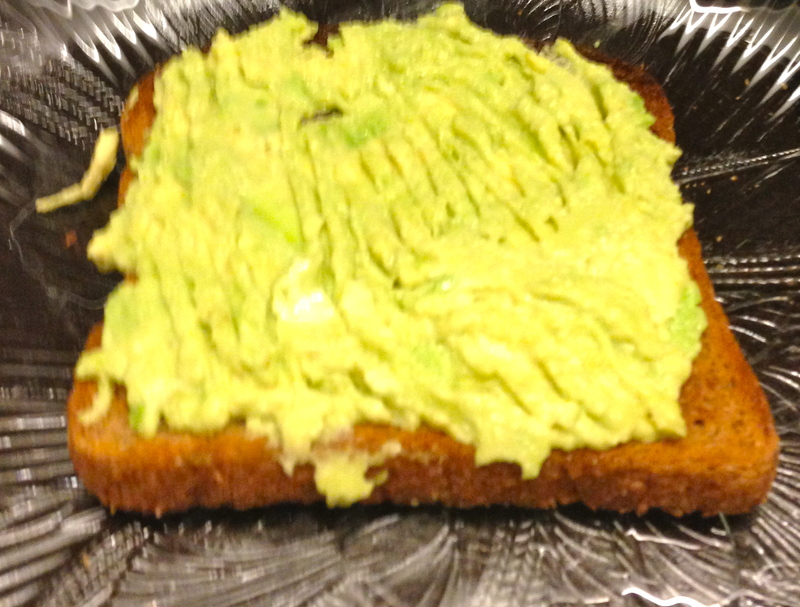 And did I mention the breadcrumbs are whole wheat? 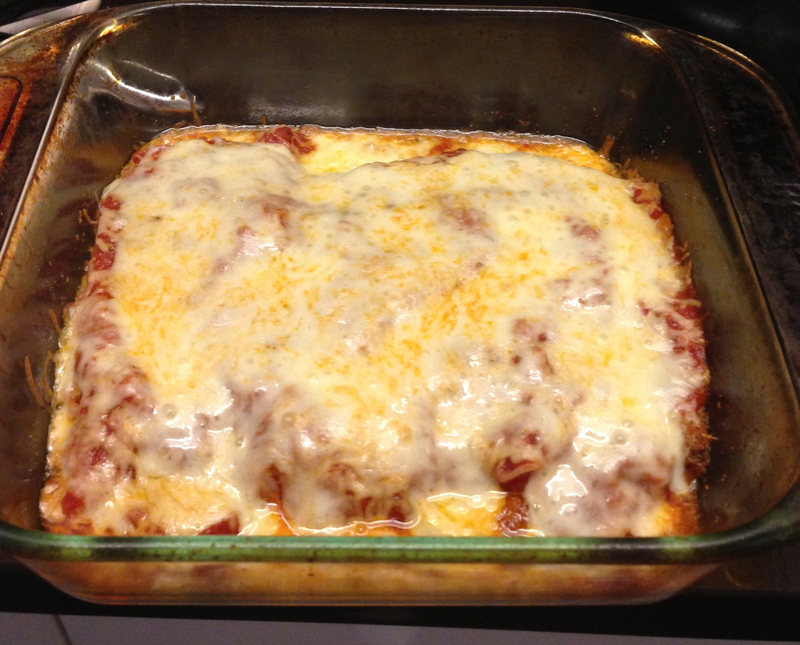 If you have thirty minutes, you have time to make this amazing twist on a traditional comfort dish. 2. Warm olive oil and minced garlic in small pan over medium heat (approximately 3-4 minutes). 4. Place breadcrumbs in bowl. Set aside. Place chicken breast in skillet, one piece at a time, and coat both sides with garlic and olive oil (be careful – the pan is hot!!!). 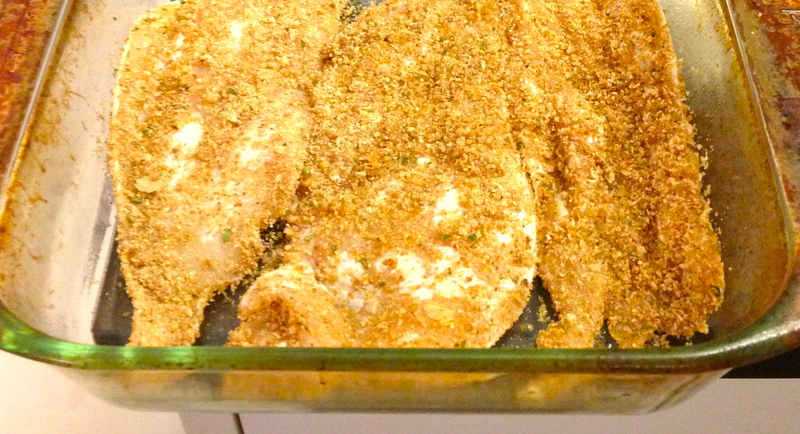 Transfer chicken breast to bowl with breadcrumbs and coat. Place chicken breast in casserole dish. 6. Remove chicken from oven. 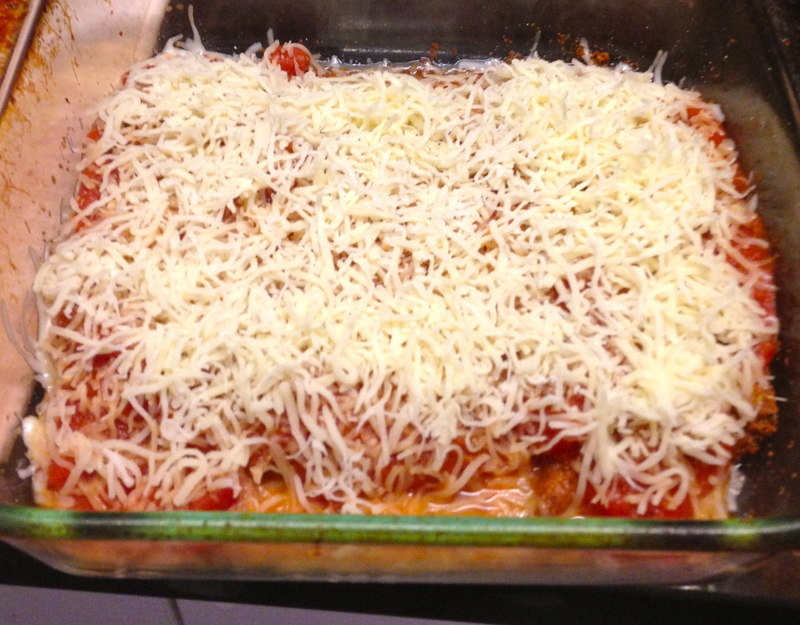 Add sauce and cheese and bake chicken for another 5-10 minutes, until cheese is melted. Enjoy! New Year, New Way To Think About Your Resolutions! So it is three days into the New Year, which means it is the perfect time to re-evaluate those perennial New Year’s resolutions. Chances are, they look something like this: 1) go to the gym 6-7 days/week 2) cut out all junk food 3) lose weight. While it is certainly encouraged to have goals and make New Year’s resolutions, it is important that these goals are both attainable and sustainable. 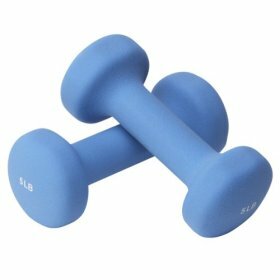 If you are new to working out and have previously worked out less than 1-2 times per week until 2014, chances are it is not going to be enjoyable or realistic to be hitting the gym 6-7 days per week. Also, cutting out all junk food is quite ambitious and, frankly, sets up unhealthy relationships with food. Food is meant to fuel your body and be enjoyed and it is important to understand that it is not the end of the world if you eat a cookie, as long as your diet is generally comprised of real, whole foods and offers your body the nutrition it needs to keep you moving, happy and healthy. So here are my guidelines to making New Year’s resolutions that will stick. Be proud of your small accomplishments – they add up. Small lifestyle modifications = large results. For instance, weight loss is a result (not a behavior). It is often best to set behavioral goals and ultimately, these behavioral goals can add up big time to give you the results you want. Possible behavioral goals include things like taking the stairs when possible, getting off at an earlier subway stop in order to walk further, walking instead of driving or taking public transportation, eat 3 more servings of vegetables each day, eat breakfast each morning, etc. These all seem small, but they are behaviors that are part of a healthy lifestyle and will ultimately help you to reach your overarching goal of weight loss, weight maintenance, being more active, or whatever your personal goal is. I bet all of those behaviors I listed above are enticing. However, if you do not currently do any of those things, attempting to start doing all of those is likely to be a set-up for failure. Making too many resolutions and goals at once can be overwhelming and ultimately, you will be less likely to do any of them. It is often better to pick just a couple of goals (I suggest starting with 1-3) and once these become routine, gradually add in more goals (who says you can only make goals on January 1st???) We are constantly evolving and should always be challenging ourselves and our goals should reflect this. So, allow yourself to start small, with just a few behaviors and allow yourself and your lifestyle to evolve gradually. Trust me, you will be much happier, healthier, and sane! Now is the perfect time for self reflection. You must meet yourself where you are in order to get where you would like to go. Currently going to the gym two times per week? Awesome! A perfect resolution would be to go to the gym 3-4 times per week, or to gradually add time doing cardio work, or gradually add more challenging workouts (such as planks and their many variations). Another great resolution would be to go to the gym at least two times a week (as you have been doing) and add in more activities of daily living, such as physical work (walking, taking the stairs, doing yardwork/housework, etc.) 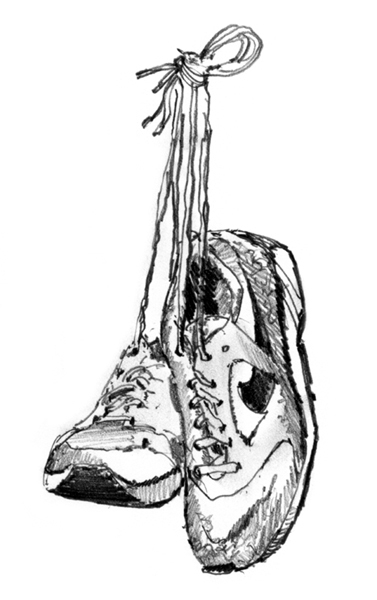 Or, my personal favorite, add in mini-workouts that do not include the gym or any equipment. Can’t stop watching your favorite show? Do mat exercises, such as crunches, squats, planks and push-ups during commercials. There, no sweat! (Well, a little sweat, but so easy to squeeze in!!!) While it would be awesome to tell yourself you are all of the sudden going to start going to the gym 4-5 times more per week than you already are, this is likely not realistic and not sustainable. Accept yourself, love yourself, and challenge yourself with realistic goals. That is how you will become stronger and reach your goals. So many clients and friends talk to me about the scale. So many people base their success off of a number reported by the scale. 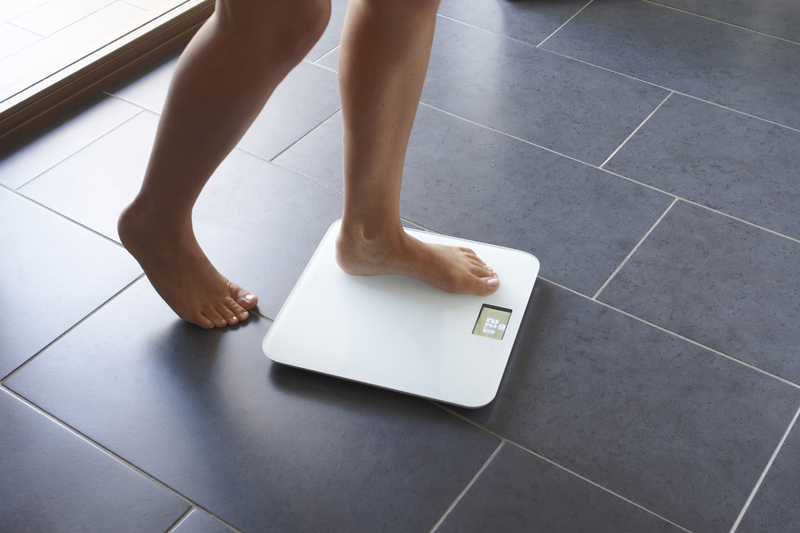 Yes, the scale reports your weight, but this number can be affected by so many factors and neglects a lot of other valuable information. For instance, your weight could be influenced by water, muscle mass, and many other factors. Your weight is not simply a report of fat and when you lose weight, you are losing not just fat but also fat free mass (which is your lean body mass). Therefore, rapid weight loss can mean dehydration and rapid loss of muscle, which is likely not what you are aiming for! Additionally, the scale does NOT report the positive changes going on inside your body, such as the relative shift in fat free mass versus fat mass, neural adaptations that occur with exercise regimens, etc. I always tell clients and friends to focus on fitness goals – these are the only numbers you should be focusing on! For instance, shaving off time from your pace per mile, adding time to your plank, adding weight to your resistance training – these are the numbers that are okay to focus on. Your weight? It is likely to fluctuate, plateau at some point, and drive you absolutely crazy! Focus on your performance and how you feel – the resulting weight (loss, maintenance, gain) will come as a result of these behaviors. Hopefully this year, these new New Year’s resolutions will stick and inspire you to continue to be active, healthy and respectful of your body. It does a lot for you and a great overall goal would be to treat it well, in any way that you can!